A whole building, either existing or demolished. The River Mersey at Hale Point can be dangerous, as the Hale Ford demonstrates. Conditions change with each tide, and formerly dry land can become swift and deep channels. The opposite is also true: hidden sandbanks can put paid to river trips heading to the manufacturing towns inland or the globally connected docks at Liverpool. Hale lighthouse goes some way to reducing the dangers. A lighthouse was built on the southernmost reaches of Hale township in 1906. 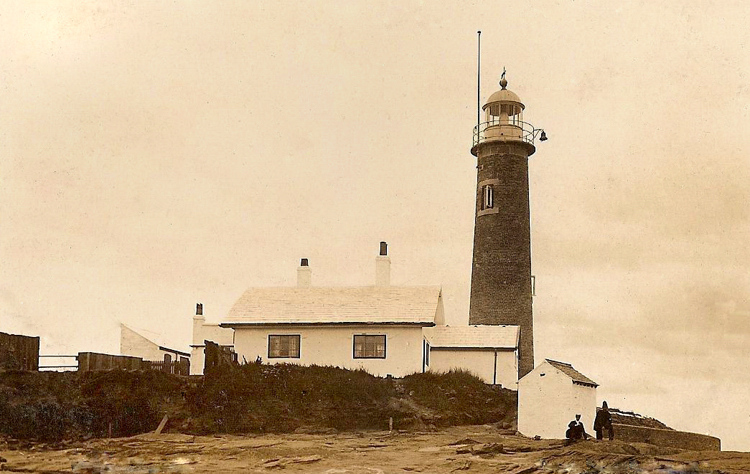 This lighthouse, which still stands today, replaced a shorter tower erected in 1838. The Ireland-Blackburne family’s private bathing house already stood at Hale Point. So the building of the lighthouse saw the conversion of this bathing house for the original lighthouse keeper’s cottage. The decommissioning of Hale lighthouse, which is 45 feet tall, came in 1958. 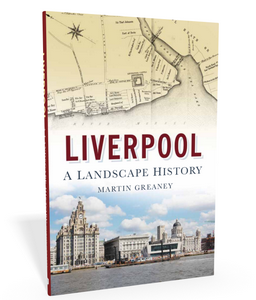 Fewer ships were travelling the Mersey as trade declined. Those ships that did head for inner Lancashire used the Manchester Ship Canal on the opposite bank. Today, buoys mark the channel for (mostly pleasure) boats to find safe passage. The demolition of the keeper’s cottage made way for a modern private bungalow. 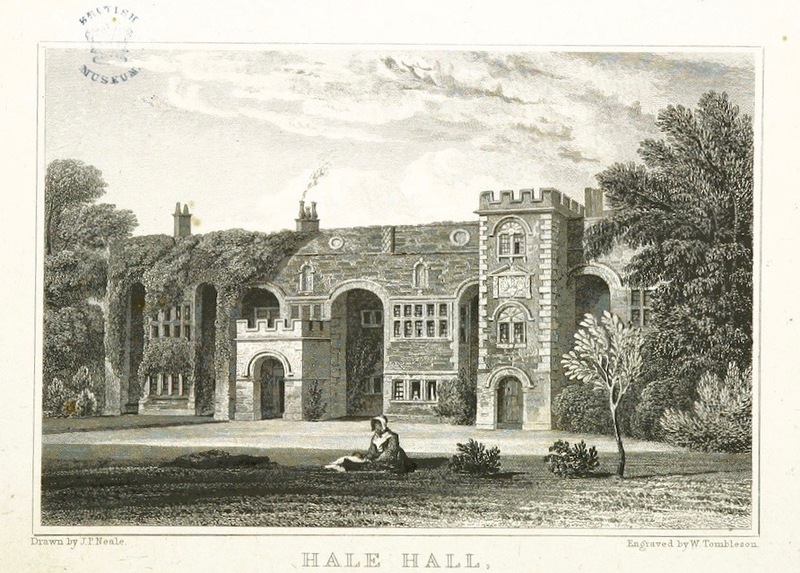 Hale Hall was a quadrangular building, begun in the early 17th century, built of local stone with a red shale driveway. 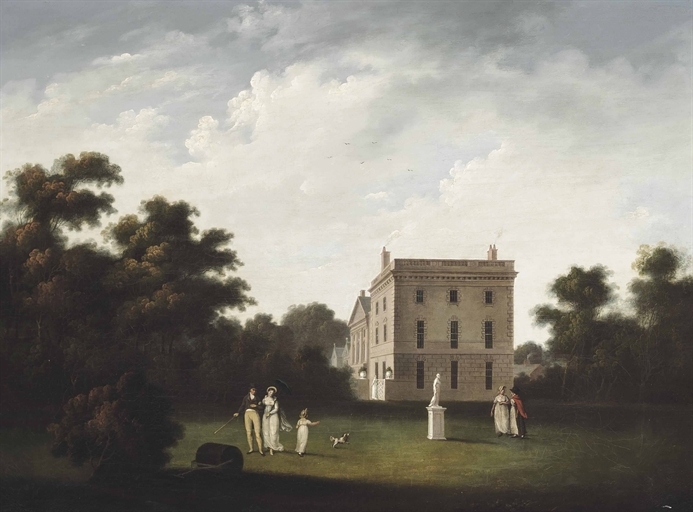 It was altered near the end of the century, and in 1806 John Blackburn added a large south front. This now matched and balanced the existing north front. John also added a lodge to the hall in 1876. The Hall had a home farm, and kitchen gardens with walls of 3.5 – 4.5 metres height. 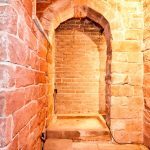 The walls were built of hollow bricks to allow warm air from underground furnaces to spread through them. The warm walls were therefore a great home for soft fruits like nectarines that wouldn’t otherwise thrive. Later on, glasshouses widened the selection, as did an ice house. The family at Hale Hall eventually, through marriage, became the Ireland-Blackburnes. A small museum within the house held, amongst other things, a coin collection as well as stuffed birds (the latter collected by Anne Blackburne). In the 1930s Robert Ireland-Blackburne and his son Gilbert left Hale Hall and moved to Cheshire. The Fleetwood-Hesketh family of Meols bought the estate in 1947. They found the Hall to be in too poor a state for them to live in, so they moved into Parsonage House. After refurbishment and extensions, Parsonage House became known as the Manor House. 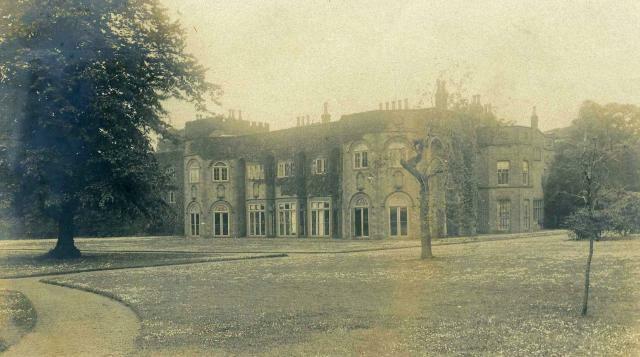 When the estate changed hands the new owners demolished the old north front of Hale Hall. Parts of Hale Park became farmland. At some point a fire destroyed the south front too, and Hale Hall fell into a ruinous state. It survived as little more than a playground for children until 1981, when it was finally demolished. (Thanks to Lyn McCulloch for this information.) Some stonework is still visible, even today. Stone window sills, stone lamp posts, pillars and even some of the original trees are still there amongst the woodlands. The building now known as Hale Manor House started life as Parsonage House. As a parsonage, the house sits just across the road from St. Mary’s Church. It is a much smaller building than Hale Hall, but nevertheless the Fleetwood-Heskeths moved in here in 1947 because of the poor state of the Hall they would otherwise occupy. The Rev. William Langford added the impressive west face to the house in the 18th century. His coat of arms and monogram sit carved in stone over the entrance. Later on, alterations to this part of the building reduced the storeys from three to two, so increasing the ceiling height of the rooms. The impressive façade hides two gable ends. The south gable is smaller and older (17th century) while the north is larger and later. The back portion of the south gable still has three storeys, while the front portion, and the whole of the north gable, have two. Perhaps the most significant of the merchant houses in the history of Allerton is Allerton Hall itself. The wealthy Lathom family built the first house on the site back in the reign of James I. They held the lands of the estate from the 15th to the 17th century, but had them taken from them when they joined the ‘wrong’ side in the Civil War. After the Lathoms, Richard Percival bought Allerton. He owned it from 1670 until 1736, when a James Hardman, Rochdale merchant, purchased the land. The earliest parts of the current building were built by Harman when he moved in. They were built of sandstone, and are considered to be the earliest examples of Palladianism in Liverpool. This innovation contributed to the decision to list Allerton Hall. When John died in 1754, his brother James moved in. James’s wife Jane outlived him, and stayed in the hall until her own death in 1799. She had been friends with the famous abolitionist William Roscoe, who now bought the house and moved in. Roscoe demolished the remaining 17th century parts of the building (which are understood to have been dangerously under-maintained), and added new rooms to balance the design. Bankruptcy forced Roscoe to sell his share of the house, and this was bought by one of his political allies, Pattison Ellames. In the 1860s Richard Wright rented Allerton Hall. Wright was a cotton merchant and ship owner with family ties to the Fraser, Trenholm & Co merchant company. Fraser, Trenholm were based in South Carolina and funded the Southern states in their war effort against the north. Many in Liverpool had sided with the South because of the merchants’ links with cotton trading, and Richard Wright was one of those. In July 1861 the Confederate flag was flown above Allerton Hall. The Hall was used as the regional headquarters of the National Fire Service during the Second World War. A blockhouse in the grounds of the house is testament to this use. 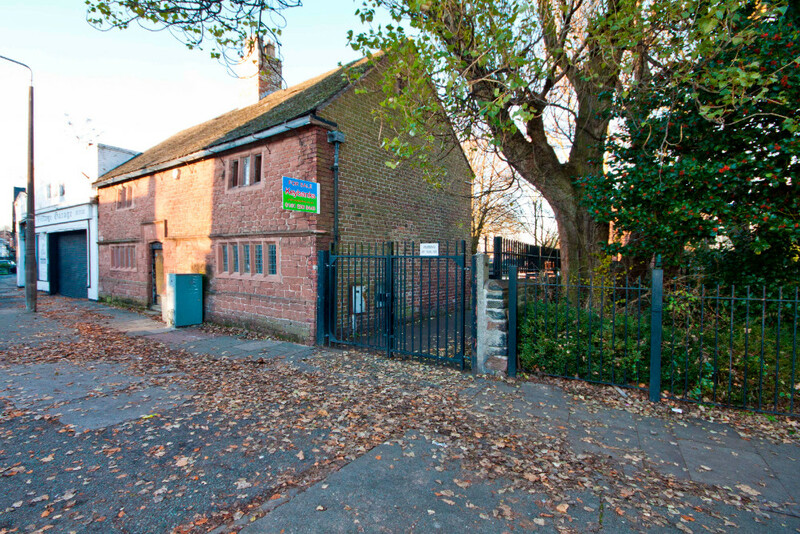 Today, the Hall is listed as a Grade II* building, with the gate piers, walls and railings on Woolton Road listed in their own right. After damaging fires in 1994 and 1995, the house was renovated. It’s now the Pub in the Park, and the former hothouse is used by the pub for its dining room. The ‘Yeoman’s House’ (as it is known locally) dates from the 1580s, so is a cherished historical feature in the village of West Derby. Others include the similarly-aged courthouse across the road. The stocks to one side, and the beautiful red brick cottages around the entrance to Croxteth Park add to the historic landscape. That’s not to mention the other monuments dotted around the area too, and the great history of West Derby in general. 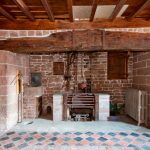 This enormous fireplace brings to mind the vast feasts that the Tudors are associated with. Yet the yeoman was generally only middling on the social scale. Still, entertaining (and keeping one step ahead of the Joneses) was a part of life. Seen also in the previous image, the tiled floor is a thing of beauty. The exposed beams are on display too, and this shot looks like something out of a museum, or a church, than a residence. Some work is required to make it a home. Even the stairs have heavy stone surrounds! 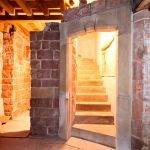 The steps themselves are stone too, demonstrating just how solid this building is from foundations to eaves. (In fact, those sharp-edges stairs look new, and could be concrete). An imaginative addition to the house, in the form of a shower basin beneath a sandstone arch. 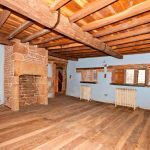 This upstairs room has wooden floorboards rather than the tiles seen downstairs. There’s also a Victorian-looking basin in one corner. Another first floor room – a bedroom with fireplace. You can see exposed stud walls here, and although the wood looks new, it’s not dissimilar to panels in other houses of the era to divide staircases and rooms. 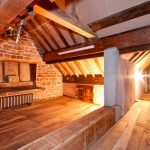 An upstairs room with a fireplace (and basin!). 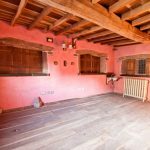 The floorboards forming the ceiling look new, and those on the floor look well-maintained. Part of the roof space, showing the exposed beams and the building materials and syles of the wall and alcove. This is the rear of the Yeoman’s House, showing the shape of the buildings and the large grass area of the garden. There’s a more modern extension on the back, and the garden goes around the back of the next door garage. 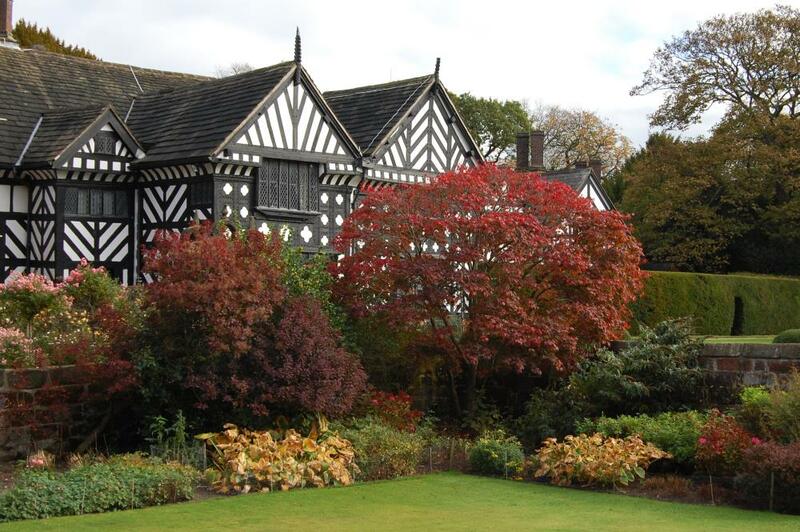 Speke Hall is one of the most famous historical features on Merseyside. Its distinctive black and white appearance, highlighting its amazing timber structure, make it a memorable sight for visitors. 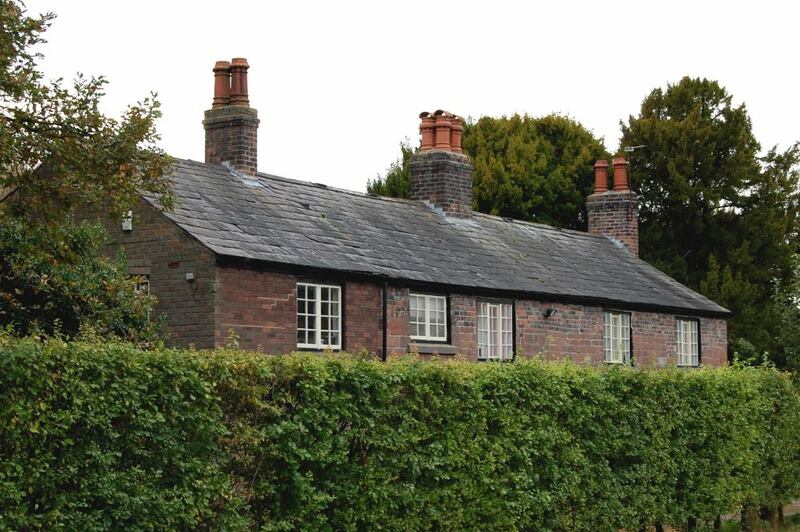 Speke Estate is centred on Speke Hall, and although much of that estate has been cut off from the Hall in the last 100 years, the landscape we see today has been shaped by the presence of the building. Long before our present Speke Hall was built, and at the time of the Norman Invasion (1066), Uctred, a Saxon, held the manor of Speke. But King William granted the lands, along with a vast tract of the hundred of West Derby, to Roger of Poitou, a prominent supporter. By 1170 the manor was under the control of the powerful Molyneux family. 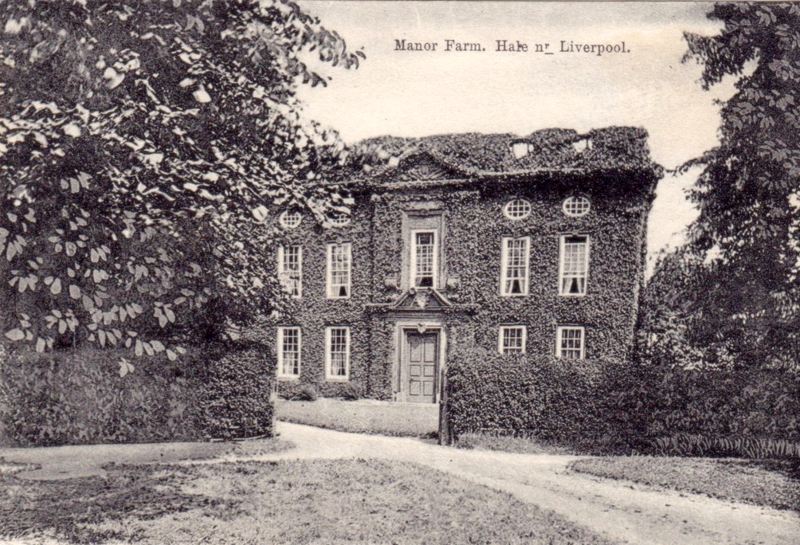 The Speke estate itself was owned in two halves by the Hazelwall and Erneys families, and the Noreis (Norris) brothers, Alan and John, married into each. 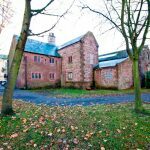 John and his wife Nicola had a house in the Clough by 1314 (this is the first documentary mention of a home on the site), and Sir Henry Norris united the two halves of the estate alongside his wife Alice later in the 14th century. Eventually the Norris family married into the Beauclerks, in whose hands the estate descended, until it was sold (the only time in its history) to the Watt family in 1795. 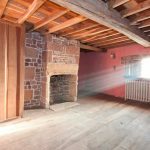 This was a low point in Speke Hall’s history, as the Watts bought an empty house, which had been neglected by its owners for some decades. The Watts left the house to tenants, for a while, but came back to Speke Hall in 1856 and began a restoration project to bring it back to its former glory. 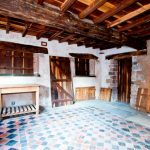 This was the first of several phases of restoration, which can be seen happening right up to the National Trust’s efforts today. Adelaide Watt was the last owner of the house before the National Trust, and she inherited the estate well before she came of age at 21. Until that time it was leased to Frederick Leyland, manager of the Bibby Shipping Company. Bibby also put a lot of money into restoration and redecoration, and added many of the Arts and Crafts features that tourists see today, like the William Morris wallpapers in the Blue Drawing Room. Adelaide Watt, when she came into full ownership of the Hall, set to developing the farm complex, even as the 20th Century was bringing with it drastic changes to the landscape in the form of industry and the aerodrome. She died in 1921, but having been determined to protect the house in the face of what she saw as the encroaching city, Speke Hall was passed on to the National Trust in 1942. The Hall had remained under the management of Thomas Watmore, Adelaide’s butler, and a number of house staff, in the intervening years. Speke Hall was administered by Liverpool Corporation until 1986, at which point the National Trust took on full responsibility. Speke Hall sits on a platform of red sandstone (like much of Liverpool), surrounded – originally on all sides – by a moat. The house is on the site formerly occupied by another building, of which little is known. The choice of spot is a strange one, and it’s not easy to understand why it was chosen for a house. At the time this building was built, the fashion for defended houses was disappearing. Castles were almost completely obsolete, but many new dwellings were designed to look defended, or to have decorative stonework which was suggestive of defence, but which provided no real protection at all. However, the wattle and daub materials, and the timber frame of Speke Hall are out of character. Many of the Tudor houses known from other parts of the country are in towns, such as the Dutch House in Bristol or the Chester Rows just over the water. Speke Hall was a literal and figurative outlier. The previous building on the site would have been Medieval, and the kitchen of the current Hall incorporates some of the features of this older structure. The moat surrounding the Hall was part of this older setting, and would have formed what is known as a Medieval Moated Site – a small yet defended rural house of a local landlord. Perhaps Speke Hall’s location was chosen simply because of the existence of this previous building in an attractive spot. The house sits on low, flat ground which slopes gently into the River Mersey. Originally the Hall would have had excellent views over the river and into North Wales, and the estate stretched right to the water’s edge. However, since the aerodrome, and later Liverpool Airport, were built the Hall has been cut off from the coast. When the new Liverpool Airport was built in 1967 a large earthen bank, the Bund, was built between the Hall and the airport land to protect the structure from the noise and visual pollution. 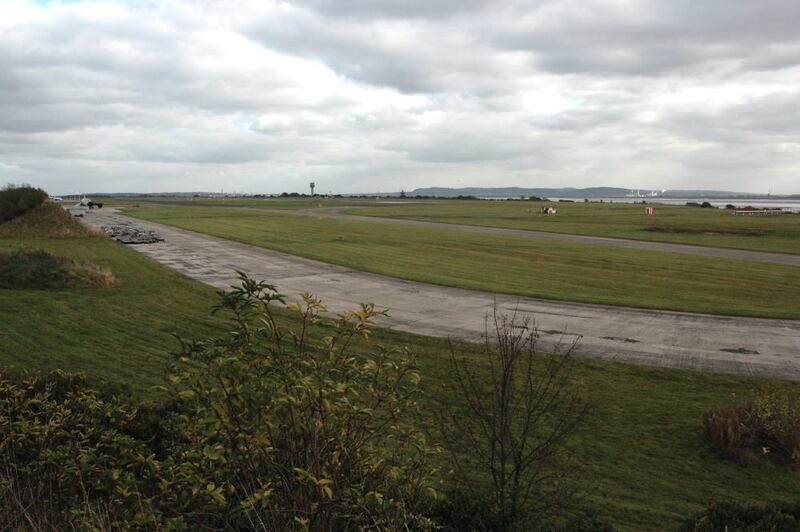 Even today you can see the taxiway which joins the sites of the current and former airport facilities, and the National Trust hopes to take this back into ownership and allow visitors to enjoy the whole of the land between Hall and Mersey. On a wider scale, the Speke Estate was once part of the vast Lancashire forest. The local area was described in 1275 as ‘wood, plain and meadow’, and included areas of marsh too, with peat cutting taking place. The term ‘forest’ was more a reference to the laws which applied in the area; the amount of tree coverage would have been more patchy. The Clough is an area of trees which still shelters the Hall from the weather, and has seen periods of felling (by the Air Ministry in the 1940s) and replanting (with beech and oak by the National Trust in recent years). Stockton’s Wood, named as ‘the heath called spekgreves’ in a deed of 1385, was probably used as cover for shooting parties. The flat, open land close to the river has made it an attractive spot in the last 50 to 100 years for several very modern usages. The first aerodrome in Liverpool made use of the clear land for easy take off and landing, and an early air mail service to the Isle of Man and Ireland operated from here for some years. The Air Ministry took over the aerodrome in the Second World War, and aeroplane parts were shipped in from America to the Liverpool docks, and stored on The Walk, just to the north east of the Hall. In the build-up to the Second World War, Royal Ordnance Factories (ROFs) had come to Liverpool, with the Rootes factory at Speke producing Halifax bombers. The sites of these factories was later seen to be useful to emerging heavy industries, what with the flat land with room for expansion. The Ford factory at Halewood is perhaps just the most famous of the establishments which have inherited this function in Speke and the surrounding area. At the same time, housing estates were created by Liverpool Corporation and City Council to house those evicted from the ‘slums’ cleared from the city centre in the 20th century. Huge numbers of houses could be built on the open landscape, and the new arrivals were conveniently located to work in the new factories. And so Speke Hall and the estate have morphed from an attractive, out-of-town location for wealthy families and businessmen into an expanding residential and industrial area with close connections to the River Mersey, the railway, and the airport. 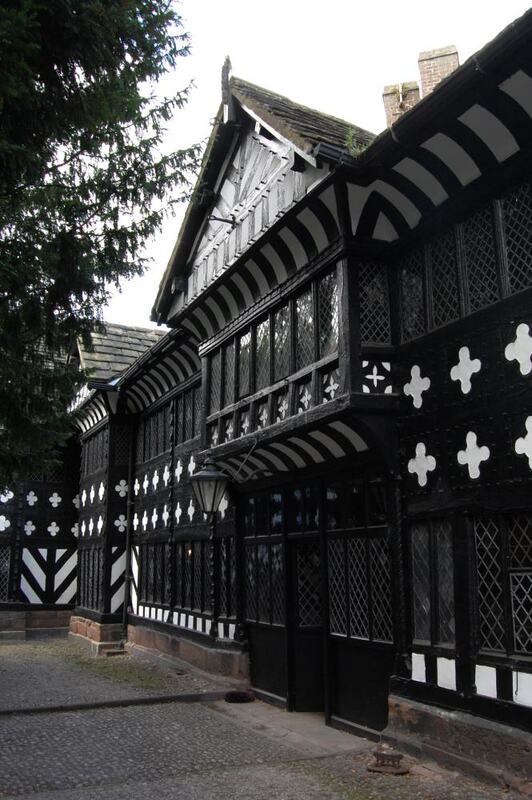 The forethought of Adelaide Watt meant that Speke Hall itself, this outstanding example of Tudor architecture, remains intact and provides a haven for Scousers and visitors alike. 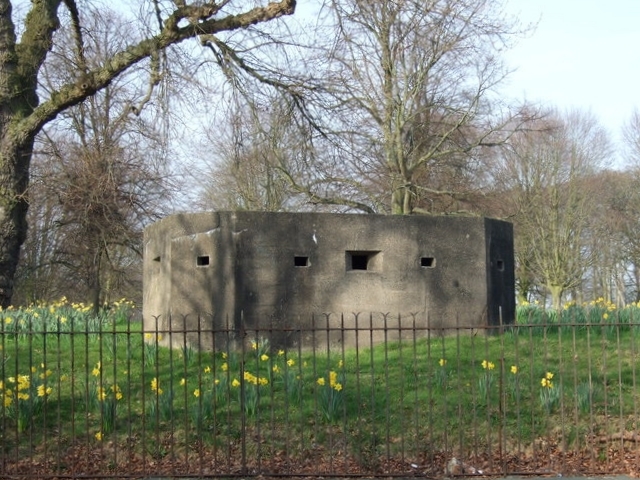 There is an octagonal pillbox in the grounds of Allerton Hall, seemingly ‘defending’ Springwood Avenue from an invisible army. While many no doubt pass it day to day without a second thought, a lot of people are puzzled as to why a pillbox is so far inland, and what feature of any importance is being defended. The early years of the Second World War were not good ones for Britain and her Allies. By 1940 a series of German invasions – of Poland, Denmark, Norway, Belgium and France – had brought the enemy to the Channel coast of France. Following the retreat from Dunkirk an invasion of Britain looked imminent, and plans were laid to repel it. The tactic used was to turn the home landscape into a ready-made battlefield, complete with anti-tank defences and machine gun positions. Although a linear defence along the coastline might seem the obvious choice, in practice it was imagined that the invaders would move quickly inland. Rather than try to hold them back, deep defences would slow the advance, and allow the enemy to pass by, all the better to attack them from the front and rear together! It would also let reinforcements arrive from around the country. While earliest-built defences did indeed focus on the so-called ‘coastal crust’, as they developed, everything from machine gun emplacements and road blocks to pillboxes and concrete ‘dragons teeth‘ were to be found further and further inland. The natural features of the landscape would also be taken advantage of. River channels, slopes and hills all affect how a moving army operates, and so the defenders can predict where a tank column is likely to rumble through. Areas can be flooded, roads blocked and obstacles (including mine fields) can be put in place. 18,000 pill boxes were built in the summer of 1940 alone – at the height of building, a pill box was built every 20 minutes. Coastal defences started on the beach. Concertina barbed wire was laid as a first line, with mine fields positioned behind to deal with both vehicles and infantry. Behind this coastal crust were designated ‘stop lines’. 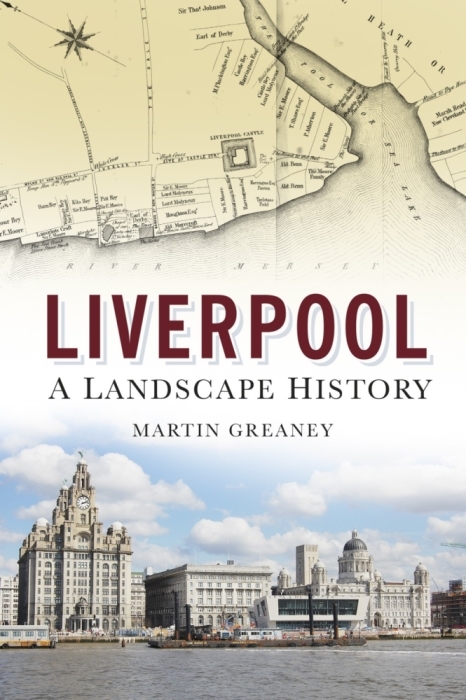 The coasts which were most heavily defended in this way were the south and east coasts, naturally, with other lines along stretches of the Welsh and north-west English coasts, including Liverpool. The south and east of England also had stop lines further inland, further barriers allowing mobile defensive forces time to muster. The length of the stop lines was reinforced with ‘island’ defences – heavily armoured clusters which could attack any army manoeuvring through the less-heavily militarised ‘seas’ between them. The idea was for the islands to funnel the enemy into predictable zones, ready for the defenders to deal with. These island defences were particularly used where there was sufficient local Home Guard units to man them. In what way are Clarke Gardens a good spot for defence? It’s hard to say for certain exactly why the grounds of Allerton Hall were a good place for a pillbox in 1940. No doubt the fact that this was land with no buildings on it played a part. It is also on a south west facing slope, and is not far from Garston Docks and a major railway junction (now Liverpool South Parkway Station). The viewshed from this position would have favoured a machine gun emplacement, and any advancing German army would have no doubt come ashore at the docks to work its way inland towards other strategic positions. 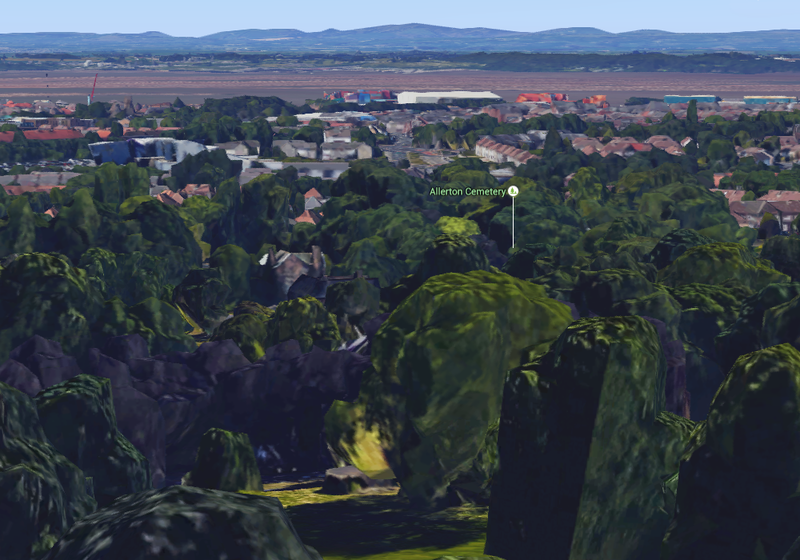 The brilliant new 3D view available on Google Maps gives an indication of the type of view afforded from the Clarke Gardens Pillbox. The River Mersey and the Welsh Mountains are visible in the distance, and the eye is drawn all the way down the slopes to the shore and docks. C N Trueman “Fortress Britain” historylearningsite.co.uk. The History Learning Site, 20 Apr 2015. 16 Dec 2015. http://www.historylearningsite.co.uk/world-war-two/world-war-two-in-western-europe/britains-home-front-in-world-war-two/fortress-britain/, accessed 27th January 2016. 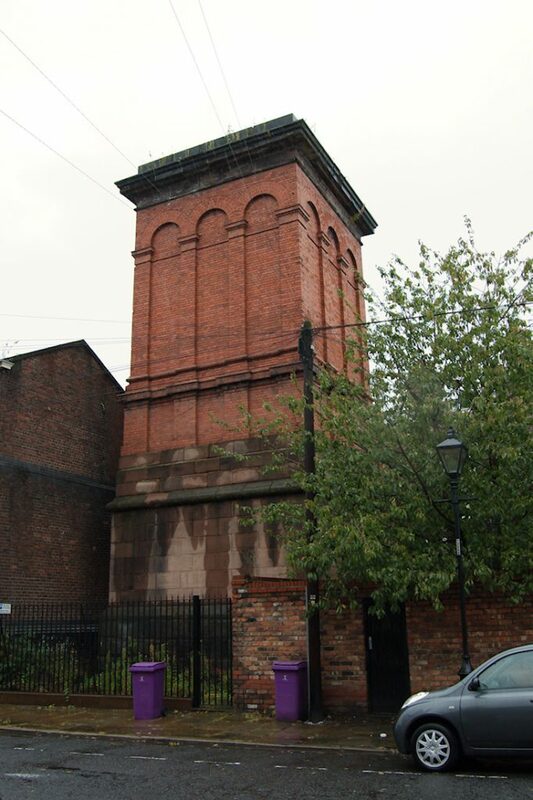 This red brick and sandstone tower on Blackburne Place is a beautiful ventilation shaft for a railway which once ran beneath it, and could be seen as representing the tunnel and railway in a nutshell. The tunnel itself, Wapping Tunnel, is partly bored through the local natural sandstone, with brick lining above, mirroring the architecture of the Blackburne Place building. The arches on the ventilation shaft are suggestive of the tunnel entrances which can be seen all along the line of the railway – the original Liverpool & Manchester Railway – particularly around Edge Hill Station and Chatsworth Drive. The building was originally one of five, with only three others – between Crown Street and Smithdown Lane and on Grenville Street South, remaining. Two were demolished, once having stood on Great George Street and Myrtle Street respectively. The shaft building on Crown Street is of a simpler, brick-only octagonal design, while that near Grenville Street South is square like at Blackburne Place. When Wapping Tunnel was being constructed, vertical shafts were dug and the excavation of the tunnel was begun at these spots, heading outwards in two directions with the intention of meeting up with the other pilot holes. After some controversy surrounding the original survey calculations the surveyor Charles Vignoles resigned and was replaced with Joseph Locke, who re-did the work. It has been suggested that the ventilation shafts like that on Blackburne Place sit on the position of those original holes, with the buildings above ground being constructed over those holes first dug in 1826. Wapping Tunnel, begun in 1826 and opened in 1830, was an impressive feat of engineering. No other tunnel had been dug under a city before, and the 22 feet by 16 feet dimensions of the tunnel were unlike anything attempted before. What is more, the tunnel was on a 1:48 incline, meaning that locomotives built in its early years were not powerful enough to pull trains up to Edge Hill from the river front. To get around this problem, carts were pulled up via ropes (and, later, cables) by stationary steam engines located close to the Chatsworth Drive exit of the tunnel. Within the tunnel itself are signal gongs, which were placed near the end of the tunnel to warn drivers that they were approaching the tunnel entrance. A small number of accidents had happened at tunnel entrances in the past where drivers had become disoriented. These gongs are still in place in brackets on the Wapping Tunnel’s wall. When opened, the interior walls were whitewashed, and the length of the tunnel was gas-lit. Pedestrians were allowed to walk through the tunnel for several years, even after it became operational, though eventually it was realised just how dangerous this was! As the southern docks declined in use with the development of ships too large to use them, the Wapping Tunnel railway became unviable, and closed to traffic in 1965. Edge Hill has had two stations. The earlier of these was the first passenger station in the world, along with Liverpool Street in Manchester. The first of the two stations opened in 1830, and sat in a sandstone cutting with three tunnels at one end. The passenger terminal at Crown Street lay at the end of one of these tunnels, but was rarely used. At the other end of the station sat a stationary steam engine. This powered the system which brought trains up the hill from Wapping Dock station. The new Edge Hill station opened in 1836, further north-east than the original. A tunnel ran from here to the new Lime Street Station, which was built as a more central passenger terminus for Liverpool than the Crown Street one. All that’s left on the ‘surface’ are the fascinating ruins of the Wapping cutting, and a small stretch of track which still sticks out into the green space between Overbury Street and Smithdown Lane. Below ground the new tunnel still takes passengers from the new Edge Hill Station to Lime Street. The tunnel and cutting now blaze an impressive streak across the inner city. David Lewis founded a small shop selling men’s and boy’s clothing in 1856. The sale of women’s clothes began in 1864, and by the 1870s Lewis’s Department Store was in full swing. There were sections for shoes and tobacco in addition to clothing. Branches were opened in other cities, beginning with Manchester in 1877. Birmingham, Sheffield and Leicester followed soon after. The building burnt down in the infamous fire of 1886, and was heavily bombed by the Luftwaffe during the Second World War. Nevertheless, it was rebuilt each time, and was refurbished in 1957. This version included the statue ‘Liverpool Resurgent’, symbolising the city’s renewed vigour following the horrors of the recent conflict. The fifth floor of Lewis’s has taken on an almost mythical status. In the store’s heyday, the 1950s, the fifth floor was the place to dine in the self-service cafeteria or the Red Rose restaurant. You could also get your hair done in the salon. A large mural decorated the walls, but this and the other features were hidden from the public in the 1980s. The floor was closed, and remained so until 2010 when it became the focus of an exhibition at the National Conservation Centre. 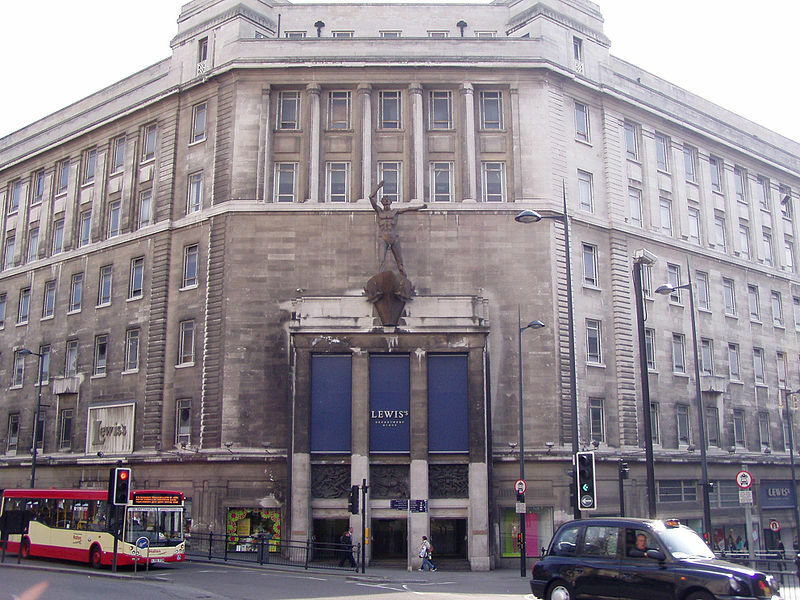 Lewis’s went into administration in 1991, and all but the Liverpool store were sold off, the majority to competitor Owen Owen. The Liverpool branch continued to trade though, until it went into liquidation in 2007. Bought by Vergo Retail Ltd in the same year, it managed to soldier on until the lease on the iconic building came up for renewal. Due to development of the area, the company was no longer allowed to stay. Despite efforts at negotiation, it remains uncertain whether Lewis’s will have a place in the new Liverpool Central Village. Recent development meant that the focus shifted to the waterfront and Liverpool One. Also in recent years the Big Dig cut off Lewis’s from its customers. It was no longer the highly fashionable place – complete with a lady behind a lectern to welcome you – to shop. 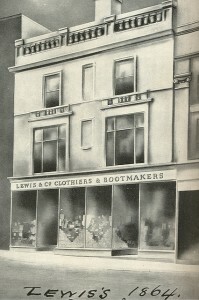 David Lewis opened his first small store on Ranelagh Street, Liverpool in 1856. It was a small, glass-fronted shop as shown in the drawing on the right. It expanded piece by piece between 1910-12 into much larger premises, which were gutted by fire in 1888. The building was once again heavily damaged, this time by German bombs, during the Second World War. It is the 1957 building, complete with ‘Dickie Lewis’, which remains standing today. This has survived as part of the redevelopment of the area. Gerald de Courcy Fraser designed the building in 1947 while, Fraser, Sons and Geary carried out construction. It is built from a steel frame with a Portland stone façade. There are several classical influences in the building. Red granite columns are topped with Ionic capitals, while the columns on the fourth floor are Tuscan in style. A two-storey colonnade above the corner entrance have Doric-style half columns. The statue Liverpool Resurgent is accompanied by relief panels depicting scenes of childhood. The figures in the panels are modelled on the sculptor Jacob Epstein’s own children and grandchildren. These represent the younger generation which Liverpool was being rebuilt for. The lifts, surprisingly, are one of the most interesting features of the Lewis’s Department Store. Some were still in place at least until work on Liverpool Central Village was begun. These lifts are original features of the building, and were operated by a member of staff through use of a lever. There were no controls for the customers! Both the fold-down seats and the lever mechanism are currently still in the building, and are mentioned in the listing description. The passenger lifts at the south east of the building still have ‘clocks’ with coloured lights. These indicated which member of staff was required on the shop floor. In addition, parts of the original customer escalators survive to the fourth and fifth floors. The rediscovered fifth floor has wood panelling, panelled doors and a tiled floor corridor. A ten foot high Festival of Britain mural on the eastern wall is made of hand painted and hand printed tiles. Another mural on the south wall shows geometric patterns and cutlery, probably designed by the same artist. 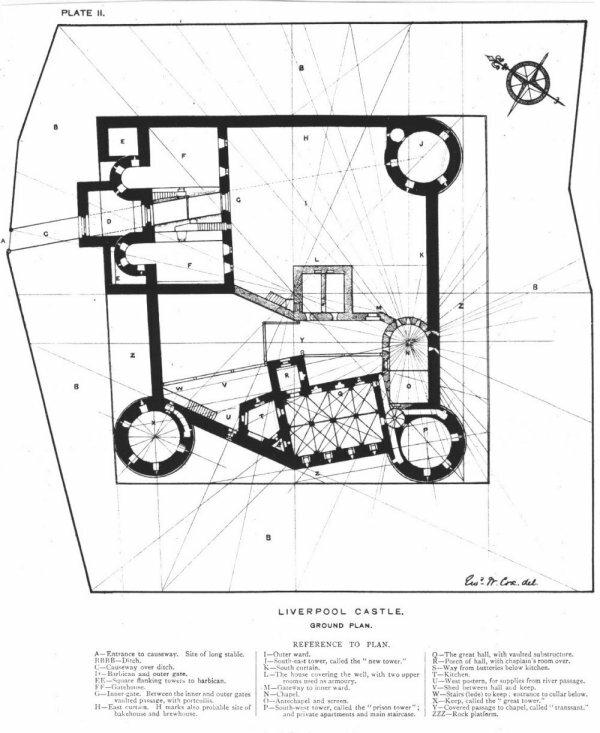 The council pulled down Liverpool Castle itself in 1715 and St George’s Church built in its place. However in 1895 E.W. Cox drew a reconstruction for the Historical Society of Lancashire and Cheshire. In the first decade of the 20th Century the first Viscount Leverhulme built a reconstruction of the ruins of the castle in the village of Rivington near Chorley. Today it stands in Lever Park, a large area of woodland on the east bank of Rivington Reservoir. The replica Liverpool Castle stands on high ground overlooking the reservoir. Though of course it can never quite match the shape of the landscape in medieval Liverpool, the lake acts as a stand-in for the Pool. (Compare this plan on Wikipedia with the satellite view on Google Maps). The position of the River Mersey itself would have been in a west to east direction, on the north side of the two most complete towers at Rivington. The castle was incomplete by the time of Lord Leverhulme’s death in 1925. Work stopped, though the majority of the intended layout was in place. Today the castle has its fair share of graffiti, and evidence of fires and drinking are all around. However, it’s a great place to go to get a feel for one of Liverpool’s lost gems.